Shade grown is the old school way to make coffee that goes back to the basics. Thirty years ago hybrid varieties of coffee plants were developed. These new plants could withstand direct sunlight and at the same time produced a greater yield of beans. It was a farmers dream except for the fact that the hybrids were more vulnerable to disease and required pesticides – for the first time. 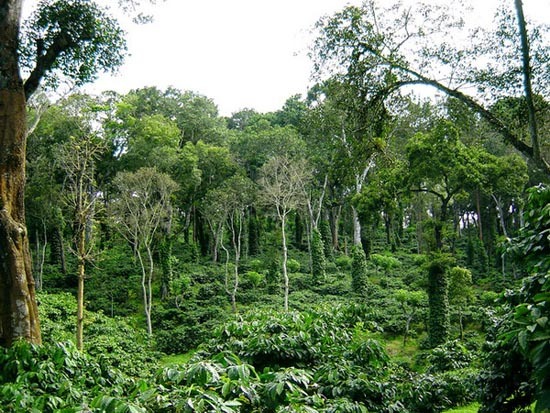 Maintaining a functioning ecosystem is the key – growing coffee in the forest shade maintains a habitat for birds and insects, allowing coffee plants to grow organically. At the same time the forest maintains a moist and nitrogen enriched soil. All together you end up with a healthier and more sustainable bean. Coffee is one of the most valuable traded commodities second only to oil. The intense demand for this product also leads to some damaging measures including the clear cutting of forested regions. It is therefore no wonder that this technique is widely favored by environmental activists. The Smithsonian Migratory Bird Center is a strong proponent of shade growing since it maintains a home for birds. They suggest that consumers buy only shade grown beans and developed a certification to make this possible. You’ll find the Bird Friendly label on any certified bag of coffee beans. What is considered shade grown is arguable. There are several growing methods influenced strongly by production value and sustainability. Some farmers use a combination of pesticides and shading. However, if you purchase coffee that is certified both organic and shade grown, you can be sure that it is pesticide free. While commercial polyculture is still sustainable, it does involve a sparser forested region to allow more room for coffee plants. Since this method involves less shade, some farmers do use pesticides. 30–60% shaded. This type of formation includes only one or two types of trees and very little shade cover. Monoculture combines modern bean growing and shade growing. 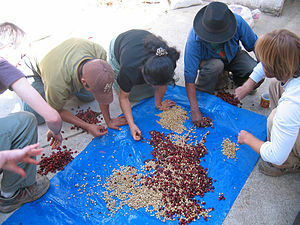 It’s not a sustainable method and the beans do require pesticides. 10-30% shaded. Add Shade Grown Coffee to your Shopping List? Coffee has an incredible impact on the world. An intense demand for this cash crop leaves a footprint on the environment; clear cutting forests and reducing nutrients in the soil. 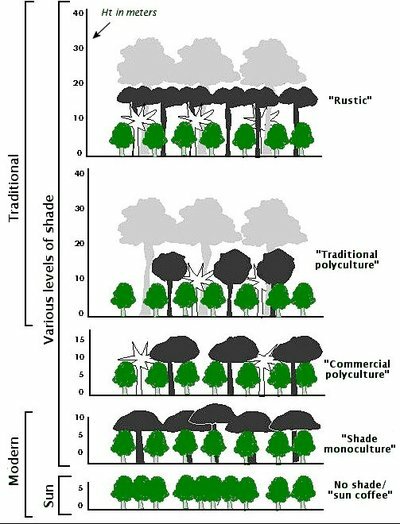 Shade growing is permaculture. It is an alternative that allows ecosystems to thrive at the same time. Everyone can participate in shade growing by choosing to buy shade grown coffee beans. One drawback is that this type of agriculture won’t make as much money since shade grown models simply won’t yield as much crop as sun baked plantations. But do we really need them to? Tags: coffee, Fair Trade, Monoculture, Organic, Polyculture, Shade-grown coffee. Bookmark the permalink. There is no doubt that coffee and the production of coffee has an immense impact on commerce around the world. The hopeful growth of quality coffee from Shade Grown Coffee sources and Fair Trade Coffee sources will increase the quality of life for the coffee growing communities. Pingback: Pre-Holiday Guest Blogging Round-up! Great article I picked up some good knowledge. Coffee plants are happier in the shade just like me. Do you think there will be a return to shade grown for comercial purposes? I think you might find some commercial operations that do have shade grown coffee, just not that many of them. Try a google search for coffee grounds shade or something like that. Thanks for writing in Shiv.